If NCM Online was asked to design a web hosting service, the resulting company would probably look a lot like HostNine. Here’s why. HostNine provides cheap hosting plans that rival those of providers that charge significantly more. Checkout is painless. The “welcome” e-mail includes everything you need. The account dashboard is simple. The cPanel control panel is intuitive. The Softaculous script installer provides 1-click WordPress setup. Server speed was amongst the fastest tested. Uptime was 100%. Hosting plans include a 45-day money-back guarantee. HostNine has earned the NCM Online designation of HIGHLY RECOMMENDED. HostNine offers three highly affordable shared hosting plans: Personal, Business, and Enterprise. All include unlimited disk space, bandwidth, subdomains, FTP accounts, and POP3/IMAP e-mail accounts. Shared plans also include 24×7 phone, chat, and e-mail support; and are backed by both a 99.9% uptime guarantee as well as a 45-day money-back guarantee. In addition to the easy-to-use cPanel control panel and the Softaculous 1-click script installer; applications include, WordPress, AwStats, Ruby on Rails, Zend, Ioncube, Joomla, Drupal, phpBB, MyBB, SMF, WHMCS, Dolphin, Moodle, and RvSiteBuilder. Single-click-install ecommerce applications include OpenCart, PrestaShop, Abante Cart, and Magento. NCM Online purchased the $3.99 per month Personal plan for testing purposes. Those interested in hosting more than 1 website should consider the $5.99 per month Business plan which includes all Personal plan features and allows up to 100 domains as well as the ability to host your site outside of the U.S. Perfect for ecommerce sites, the $9.99 per month Enterprise plan includes all Business plan features, while adding a dedicated IP address, SSL certificate, and free domain name. We know of no other high-quality host that provides as much for less than $10.00 per month. HostNine shopping cart screenshot. Click to enlarge. HostNine’s services are also scalable. In addition to shared hosting plans, they offer a range of cloud VPS (virtual private server), dedicated server, and reseller hosting plans. The HostNine experience begins with checkout. We were impressed by the simplicity of their shopping cart. Price before promo code discount, price after application of discount, and the recurring annual cost were all clearly displayed (screenshot right). Should you have a question, live chat assistance is available 24×7 with one click – without leaving the shopping cart. In addition to credit card (one-time or recurring), payment options include PayPal. The “new account” confirmation e-mail was received within one minute of checkout (prior to the PayPal receipt). One minute later, we received the “welcome” e-mail which detailed everything we needed to set up hosting. It included the control panel login, nameservers, FTP login, and e-mail account settings. Our test-site was up in minutes. HostNine Uptime Test Results Chart. Click to enlarge. 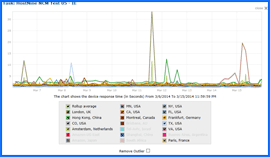 The Dotcom-Monitor third-party speed and uptime test data confirmed our positive opinion of HostNine. The shared server, datacenter, and network are very fast and ultra-reliable, scoring a perfect uptime rating over the course of our testing. See uptime test results chart right. All web hosting services reviewed by NCM Online are purchased and subjected to our 10-day test for uptime and speed. HostNine recorded an impressive average speed of 1.2555 seconds to load our test site from 13 locations worldwide, and only 0.9765 seconds from 7 U.S. locations. 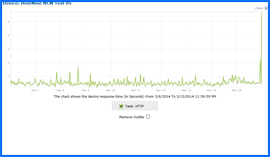 See page load speed test results chart below right. Tested for uptime every 15 minutes over 10 days, HostNine produced a perfect 100% reliability score. HostNine Speed Test Results Chart. Click to enlarge. Finally, we don’t specifically know what HostNine did or did not do to merit a B- BBB rating. All we can tell you from examining the published information is that it is based on a single 2013 complaint related to “advertising/sales issues.” It is our hope that HostNine can resolve this matter as it blemishes an otherwise stellar reputation. Our HostNine experience was nothing but positive. Whether you are an inexperienced webmaster or seasoned internet professional, HostNine will meet or exceed your expectations. They are in our opinion, everything a low-cost web host should be. HostNine has earned 4.5 stars and NCM Online’s highest recommendation. Cheap website hosting company price comparisons based on 1-year term list price before coupon/promo codes or limited time/introductory offer discounts. These are the renewal rates for the second year of hosting. 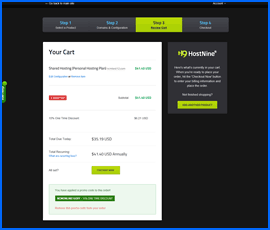 To ensure that you receive the most affordable HostNine pricing possible, please visit our Web Hosting Coupon Codes page for current discounts and special offers before making any purchases. HostNine, which was founded in 2006, is committed to constantly reviewing and improving its services and products so it can stay far ahead of its competitors. More importantly, it is devoted to providing customers with all that they need to achieve business success. HostNine’s product development team is continually researching and developing new ways to make life simpler for businesses and webmasters around the globe. HostNine’s personnel include web hosting gurus, administrators and technicians. The skills of the staff allow the company to provide clear and quick customer service. The support team is available to answer customer queries 24/7 throughout the year. HostNine’s management team believes that dependability and uptime is the key to providing high-level service and they make such service a priority. They know that clients do not have the time to read the lengthy and complex service level agreements offered by many hosting providers, so they offer an uptime guarantee that is easy to read and understand. HostNine is committed to utilizing world-class hardware and having the expert staff needed to maintain it. The company’s managers won’t use low-end hardware to cut costs. They carefully choose the most dependable server hardware available to drive their network. Their platforms use a well thought out blend of recognized industry products and exclusive in-house solutions. Keeping hosting closer to clients is critical for both website SEO and speed. That’s why HostNine’s web hosting network consists of multiple data centers located on three continents. All of these centers are dependable and provide world-class network speeds. Customers can select their preferred location in the UK, US, Netherlands or Asia, and still take advantage of the various benefits offered by practically all of the company’s hosting plans. HostNine makes it easy to for customers to change hosting plans if they discover their website has gotten too large or complex for their current plan. Customers can select the plan that best fits their website’s changing needs. If the client needs assistance, the support team can provide advice on what plan will fit them best. HostNine believes in keeping life simple, so there’s no penalty or other charge for changing plans. Locking customers into long-term plans or refusing to assist them in switching goes against everything the company stands for. HostNine knows the value of customer data and does all that it can to keep it secure. The company has launched an in-house customized backup plan, which has allowed it to create a complete backup ecosystem. Data is remotely backed up across numerous data centers each night, providing customers with the power to restore valuable data immediately. HostNine is dedicated to offering high-quality web hosting at reasonable prices. The company continues to expand because customers like its low prices and the value they receive for their money. The firm’s first priority is to provide the best customer experience and it believes that it is successful in doing so. The company wants all of its customers to be content and therefore guarantees that if a customer is unhappy for any reason during their first 45 days of service, they can request and receive their money back. This video tutorial demonstrates the installation of WordPress on a HostNine shared hosting account using cPanel and the Softaculous 1-click applications installer.